The Thermal Monitor, an integral component of IC2 Nuclear Control. Thermal Monitor measures heat level of Nuclear Reactor. 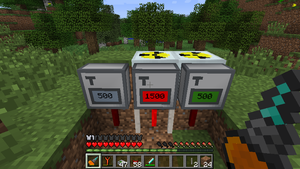 If reactor reaches specific heat level, Thermal Monitor changes color of indicator to the red and emits redstone signal. Right click to open GUI. You can set any temperature in the range 0-15000 with step 100. Use Sneak + Right click to prevent GUI from opening. Remote version of Thermal Monitor. It doesn't require direct connection to Nuclear reactor. Instead it requires Sensor Location Card (a part of Remote Sensor Kit, described below) and consumes 1 EU/t. Energy consumption can be increased via the remoteThermalMonitorEnergyConsumption config parameter. Default energy storage is 600 EU, max packet size before explosion is 32 EU/p. Energy storage and max packet size can be increased with energy storage and Transformer Upgrades. Power can be supplied via wires or with energy storage items from IC2 (battery, Energy Crystal etc.). Signal from remote sensor can be received on the distance up to 8 blocks in each direction from reactor. To increase range - use Range Upgrade item. As additional feature this machine shows a progress bar of reactor heating (100% is a signal level). You can adjust facing of indicator with IC2 wrench. When machines do not have enough power, an indicator has a dark gray color. It also indicates if reactor can't be found or too far with bluish gray color. Sneak+Right Click with a wrench allows to rotate Remote Thermal Monitor around an axis. Regular thermometer measures the temperature of a reactor (right click on reactor or on reactor chamber). Digital thermometer measures the temperature of the reactor and displays other temperatures (water evaporation point, reactor melting point). It should be charged after crafting and can be recharged. Pair of remote sensor and Reactor Sensor Location Card. Use a kit on reactor (right click) to mount a sensor and receive location card. Reactor Sensor Location Card should be placed to the Remote Thermal Monitor in top-right slot or to the Industrial Information Panel as data source. If you don't need Reactor Sensor Location Card any more - you can get back 2 circuits (shapeless crafting recipe). Pair of remote sensor and Energy Sensor Location Card. Use a kit on energy storage (right click) to mount a sensor and receive location card. Sensor Location Card should be placed to the Industrial Information Panel as data source. Supported storages: BatBox, MFE, MFSU, Lapotron Energy Storage Unit. If you don't need Energy Sensor Location Card any more - you can get back 2 circuits (shapeless crafting recipe). Industrial Information Panel data source. Card which contains multiple Energy Sensor Location Card. To receive Array card you should combine 2 to 6 Energy Sensor Location Cards on your Crafting Table. Energy Array Location Card can be used as data source for Industrial Information Panel. To add new Energy Sensor Location Cards to the Array - combine them with Crafting Table. If you don't need Energy Array Location Card - you can get back 2 circuits per each Energy Sensor Location Card in the array. Industrial Information Panel data source. Allows to display time data on panels and screens. You can use this item to increase range of the Remote Thermal Monitor and Reactor Information Panel. Each upgrade doubles max range. Panel block, which shows multiple parameters from data source card. Information panel also supports range upgrades. Panel shouldn't be attached to energy net. Use redstone signal to turn it on and off. You can configure set of parameters to display via GUI. Block can be rotated and removed with wrench. Sneak+Right Click with wrench allows to rotate Information Panel around an axis. Components to build large screens for your control room. Each screen contains one Information Panel and one or more of Extenders. All of them should be facing in proper direction (green side should form a rectangle). Block can be rotated and removed with wrench. Measures the amount of energy passed through the counter. It has one input side (marked with point) and 5 output sides. By default Energy Counter accepts LV (32 EU/p) and outputs 32 EU/t. But you can use Transformer Upgrades to increase in/out packet size. Energy Counter with 4 upgrades will accept up to 8192 EU/p and will output 8192 EU/t. Measures the amount of energy passed through the counter per tick. It has one input side (marked with point) and 5 output sides. By default Average Counter accepts LV (32 EU/p) and outputs 32 EU/t. But you can use Transformer Upgrades to increase in/out packet size. With 4 upgrades it will accept up to 8192 EU/p and will output 8192 EU/t. Pair of remote sensor and Counter Sensor Location Card. Use a kit on Energy Counter or Average Counter (right click) to mount a sensor and receive a location card. Sensor Location Card should be placed to the Industrial Information Panel as data source. If you don't need Counter Sensor Location Card any more - you can get back 2 circuits (shapeless crafting recipe). Kit to mount sensor on liquid containers. You can monitor liquid type and amount of it in BC tanks, Railcraft tanks, Coke Ovens etc. When this block is powered by a redstone signal, it makes a loud siren noise. Alarm volume (signal range) can be changed via GUI. The default volume is 64 blocks. If you want to increase or reduce the default range – check “alarmRange” parameter in the config file. You can also change the sound of the Howler Alarm via GUI. To add your own sound - put it in the "resources/newsound/ic2nuclearControl" folder in your minecraft folder. Sound should be in ogg format and its filename should start with "alarm-" and add it to allowedAlarms config param. Additional config params: maxAlarmRange parameter specifies maximum value in the Howler Alarm GUI. SMPMaxAlarmRange parameter can be used to protect you from noisy neighbours. All alarms volumes will be limited by this value for you. Upgraded version of Howler Alarm. It combines flashing light signal with sound signal. You can configure signal range, but it uses only default siren sound. Takes Energy Sensor or Energy Array card and emits a redstone sigal in specified range. Starts at higher value and stops at lower. Allows to enter 10 lines of text, to display on Information Panel. Each line can have up to 32 characters. Upgrade item for Industrial Information Panel. Allows to change Panel colors. This page was last modified on 27 December 2017, at 00:48.